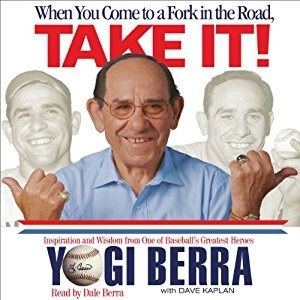 When You Come to a Fork in the Road, TAKE IT: Inspiration and Wisdom from One of Baseball’s Greatest Heroes by Yogi Berra, with Dave Kaplan (©2001, Hyperon: New York, NY) is funny, insightful, and inspirational all at once. I have always been a big fan of Yogi as he seems like such an unlikely hero. He doesn’t look like a star athlete and at first, his speech doesn’t sound like it contains a lot of wisdom. He was the son of poor immigrants and dropped out of school after the 8th grade. In spite of this be became an MVP and winner of a record ten world series. He was a successful manager and many of his quotations have become known throughout our culture. As this book shows, they are not just amusing. The quotes along with Yogi’s philosophy contain a lot of wisdom mixed in with the humor. 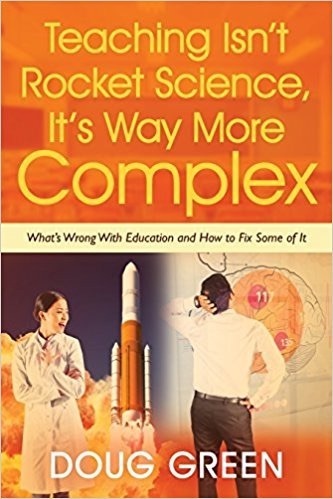 Many apply very well to the field of education as I try to show here. There are a lot of pages, but they are short and good. Throughout life you come to serious forks in the road – decisions. No matter what decision you make, taking a job, getting married, buying a house, whatever it is, you shouldn’t look back. Trust your instincts. I’ve always done things that feel right. Learn from the choices you make and don’t second guess yourself. On big life decisions get all the advice you can. Talk it over with parents, a mentor, a teacher, or a coach. They’ve had more life experience. They have more miles on them and can help you get on the right path. A teacher once asked me, “Don’t you know anything?” I said I don’t even suspect anything. Nobody can help but be nervous in the World Series or at a job interview, or giving a presentation, or when you’re called on in class. You have to channel that nervousness. Enjoy the moment and make it a great experience. You need to learn to relax. You can’t be afraid of making a mistake. There’s always the next inning or the next day. Life goes on. There were many times I had to help my teammates so that bad things didn’t happen. When you’re part of a team you stand up for your teammates. Your loyalty is to them. You protect them through good and bad because they’d do the same for you. This entry was posted on Friday, September 2nd, 2011 at 2:18 pm	and is filed under Book Summaries, Business Books, Education Books, Leadership Books. You can follow any responses to this entry through the RSS 2.0 feed. You can leave a response, or trackback from your own site. I am extremely impressed along with your writing talents as neatly as with the format in your blog. Is this a paid subject matter or did you modify it yourself? Either way stay up the excellent quality writing, it’s uncommon to see a great weblog like this one nowadays..
My web host http://www.gorges.us/ did the modification for me. Glad you like my work. Please share with your network.